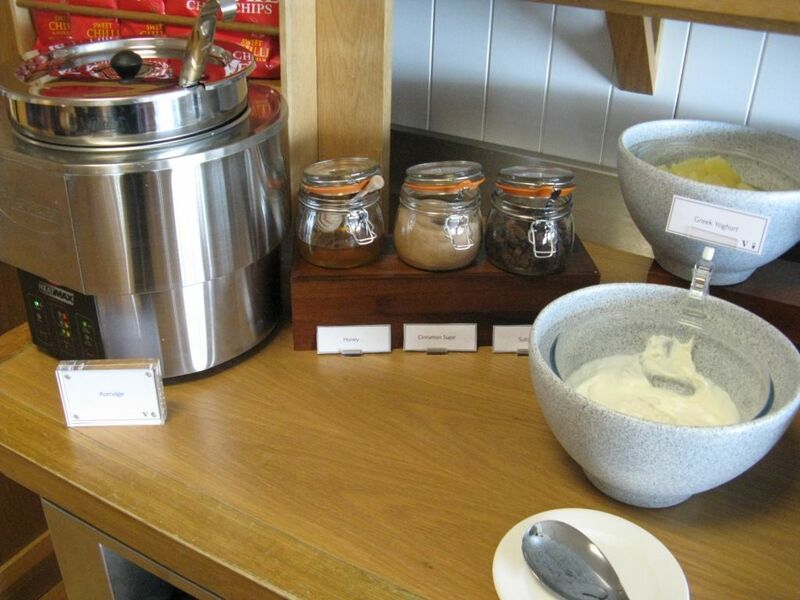 This thread gives the current catering options for the BA & third party lounges outside the Metropolis, namely Newcastle, Manchester, Belfast, Edinburgh, Glasgow, Belfast, Leeds, and Aberdeen. 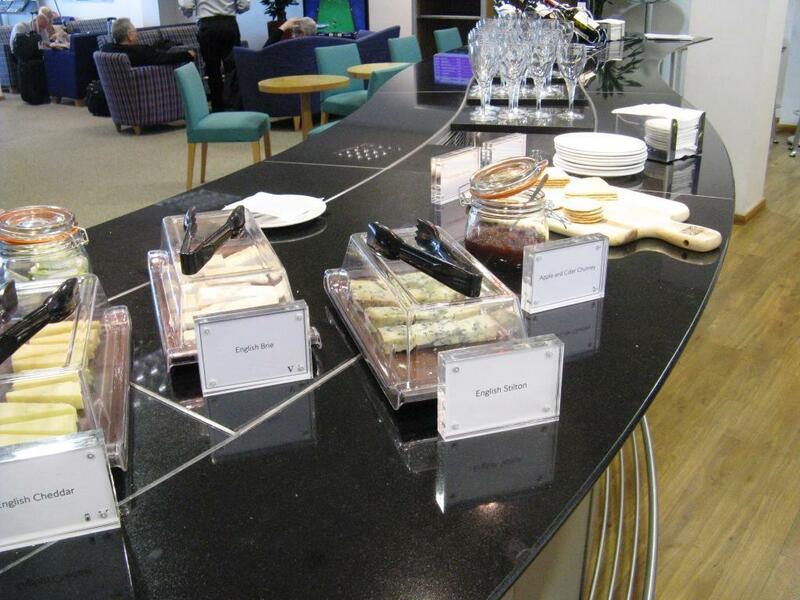 The catering supplier for the BA lounges was changed on 28 April 2013 to BaxterStorey. The current catering options can be found in the first post in the thread, or you can click here. This thread is to help explain the catering options for UK Domestic lounges outside the Metropolis. 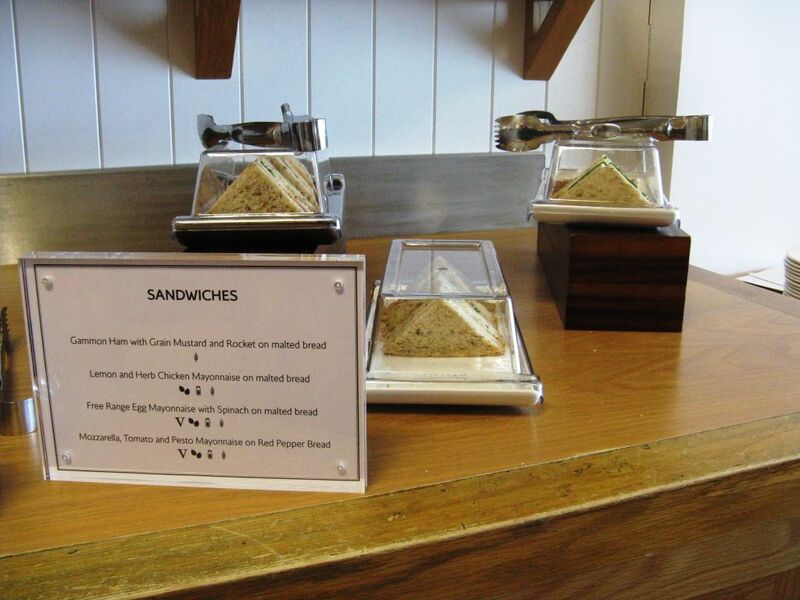 From 28 April 2013 the food and beverage arrangements were changed after BaxterStorey were awarded the catering contract. The lounges covered by this thread are Aberdeen, Edinburgh, Glasgow, Manchester and Newcastle (at this stage). I don't have any specific information for Jersey or Belfast. Isle of Man and Leeds Bradford are third party lounges. 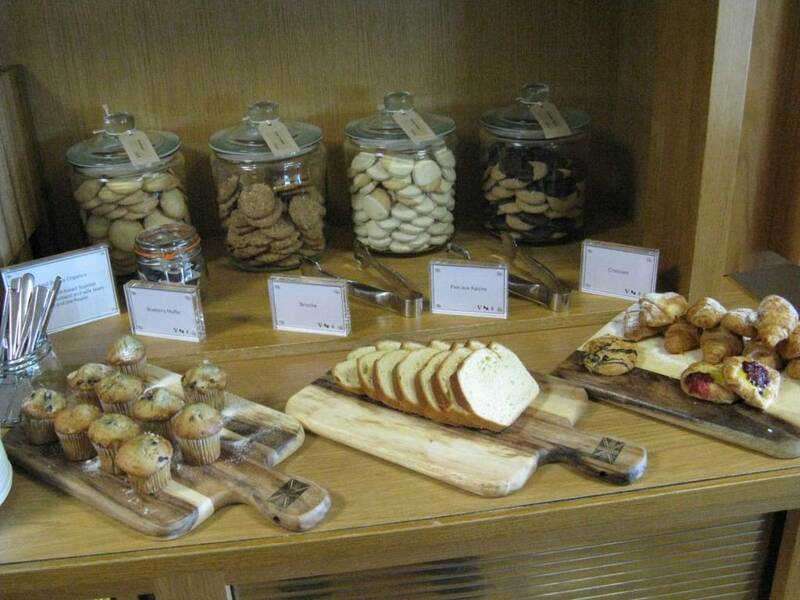 See this thread for details of the new London Gatwick First Lounge offering. The second post on that thread includes the note that BA are distributing to passengers to explain the changeover. Housekeeping note: This thread is work in progress. Catering arrangements for LHR T3 and T5 has also changed, and I'll update the existing threads for Club, First and the Concorde Room lounges later today. This is taken from Newcastle. Breakfast is now available until midday and is a sharply improved offering. From top left - grapefruit segments, orange segments, Swiss muesli, corn flakes. Front row - greek yoghurt, strawberry yoghurt, rice krispies. Also available: Weetabix. 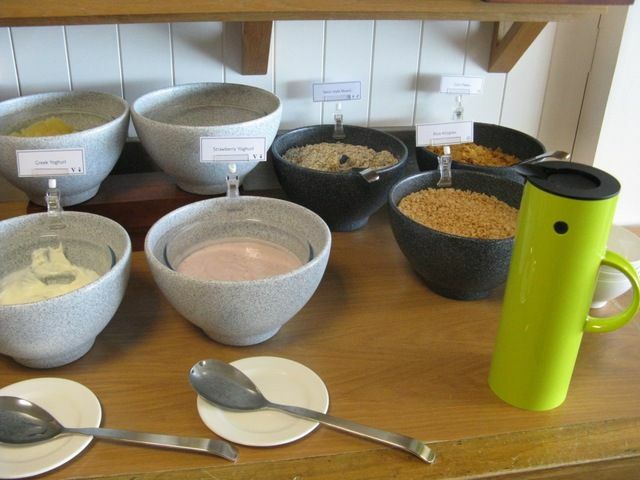 There is now a heated porridge vat on offer, replacing the Quaker Oat tubs. The flavourings on offer are honey, cinnamon sugar and raisins. This is the first time in recent history that hot food has been served in this lounge. From left: blueberry muffins, brioches, pains aux raisins, croissants, Danish pastries. Note the Island Bakery Organics biscuits in the jars at the back (handmade on the Isle of Mull, and the best biscuits I have ever come across): Shortbread, apple crumble, lemon melts, chocolate ginger. 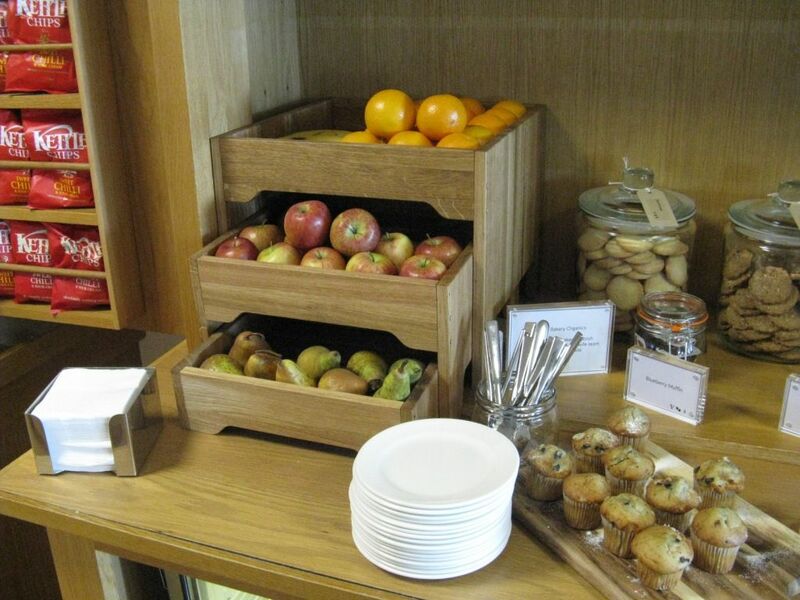 Extended fruit options now include bananas, oranges, apples and pears. 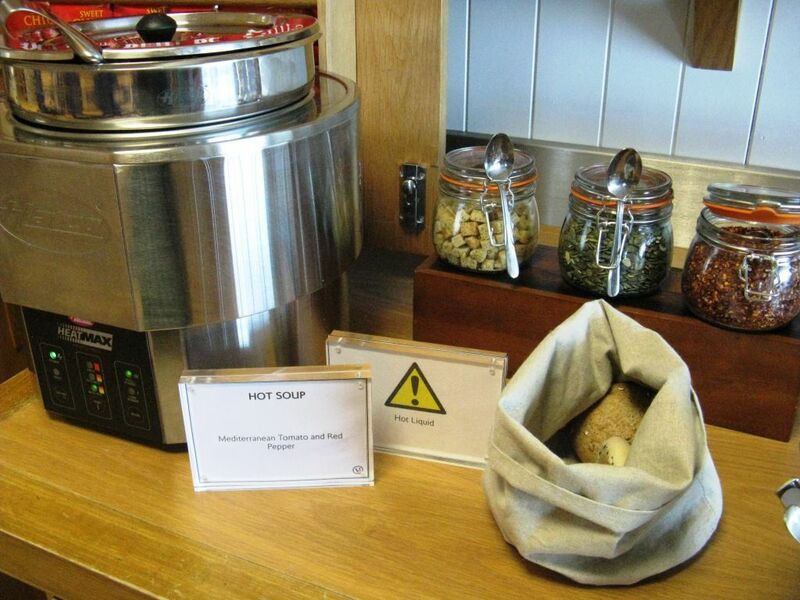 There are 4 soups on rotation, served from a vat. Today we have Mediterranean tomato and red pepper (vegetarian), served with assorted rolls, croutons, pumpkin seeds and chilli pieces. This is new for domestic lounges (apart from T1). New flavours, and tastier, though fewer options that previously. * Mozzarella, tomato, and pesto mayonnaise, on red pepper bread (vegetarian). Yes we have fruit cake, or rather Fruit Loaf. Also Maderia Cake, plus the Island Bakery Organic biscuits mentioned above. In the fridge there is also some sort of carrot cake squares, along with Cornish clotted cream (so presumably there are scones around too). We used to have to make do with mini packs of plasticated mass produced cheese. Now are have advanced to English cheddar, English brie, and English stilton, along with Apple and cider chutney, oatcakes and Carrs' Water biscuits. 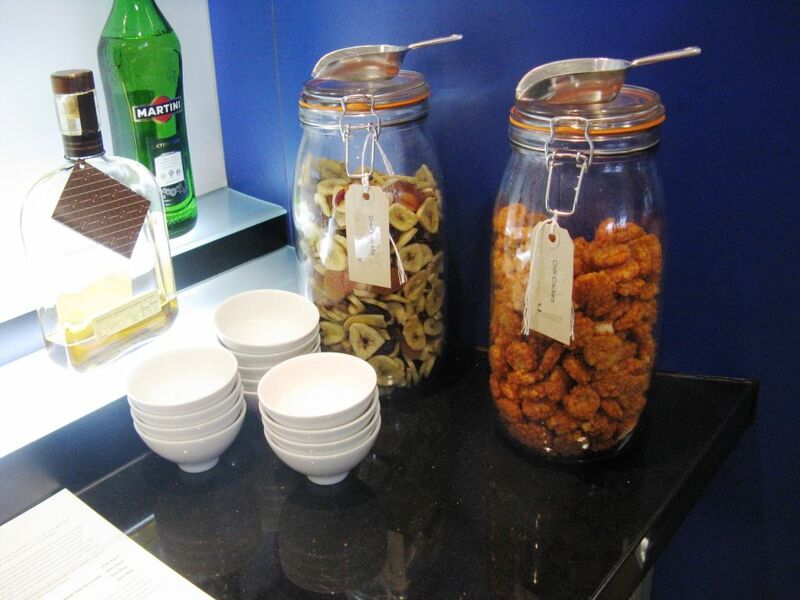 Replacing the small wrapped packets, we now have Avery jars of nibbles, flavours available today include fruit mix, chilli crackers and (out of the picture) British Airways Savoury Mix. There are also 3 variety of Kettle Chips (no change): salted, cheese and chilli. This is a significant improvement on the previous offering at domestic lounges. There are more food options, it is served more attractively, and the quality seems high. For example the previous croissants were low on taste and somewhat rubbery in texture, the new ones are lighter and more flavoursome. The biscuits have been switched from wrapped mass produced Walkers biscuits to a small company serving organically produced handmade biscuits. Indeed the general story is - at least some hot food, and a movement away from small wrapped packets of mass produced food, towards platters of tastier and more varied options. The staff are very pleased to see this change, even though it is a lot more work for them, simply because it adds a bit of pride to the offering. Well done British Airways and BaxterStorey! 29 April - opening post - breakfast options. 2 May - rest of the day menu. Last edited by corporate-wage-slave; May 2, 13 at 11:04 am Reason: see above. See this thread for details of the new London Gatwick First Lounge offering. Housekeeping note: This thread is work in progress. It will take me a few weeks to get around all the lounges, and in the past there were minor differences between the lounges. So any updates and photos would be welcome, and by all means PM them to me if you prefer. Catering arrangements for LHR T3 and T5 is due to change later in the week, and I'll update the existing threads for Club, First and the Concorde Room lounges on Thursday or Friday. This is a significant improvement on the previous offering at domestic lounges. There are more food options, it is served more attractively, and the quality seems high. For example the previous croissants were low on taste and somewhat rubbery in texture, the new ones are lighter and more flavoursome. The biscuits have been switched from wrapped mass produced Walkers biscuits to a small company serving organically produced handmade biscuits. What about fruitcake? 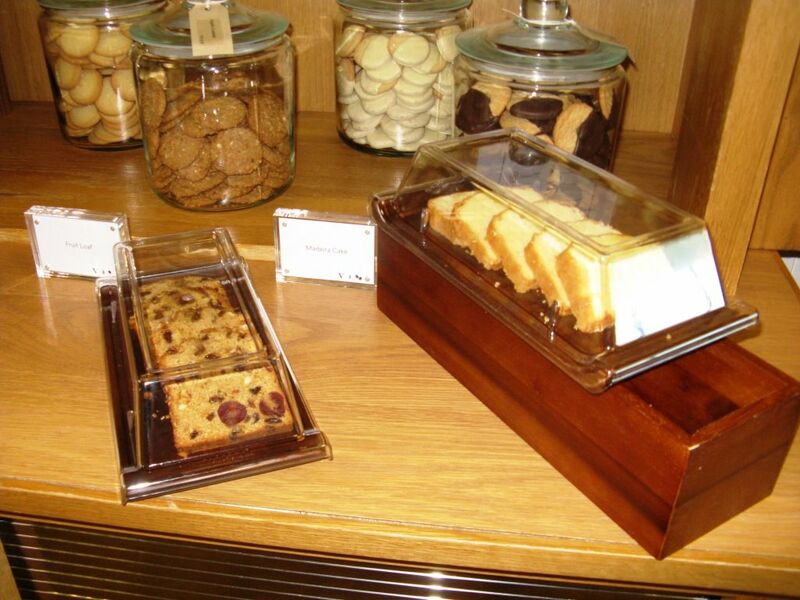 Under normal circumstances Walkers Fruitcake is all I eat in lounges. Please say it's still there! Fruitcake is gone! Happily we still have Fruitcake. I believe there are now cake options between 3pm and 5pm. Yep! But I really doubt you will miss them after you have tried the replacement biscuits. At GLA yesterday they had ginger biscuits half-covered in chocolate. Rather yummy. They were stored in a jar and so not wrapped which makes them more difficult to steal! Glad this isn't happening at Domestic Lounge T1 LHR - we would never cope with the choice! It also makes it quite unhygienic! Much as I love my Fruitcake, I still want my fruitcake! I did actually think that at the time - there were no tongs so I had to make sure I pulled out all the ones I had touched! Those open bowls of cereal and yoghurt are a bit of a turn off for me. There are a lot of people about who don't posses buffet etiquette. A pet hate of mine at hotel breakfast buffets are those who use the baked bean serving spoon for spooning out the scrambled eggs.